Pre-assembled cable is the end of the cable finished with connectors. It can be either on the one or both ends of the cable. 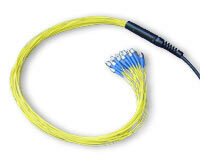 It is very economical solution as it enables to save the time needed to collocate connection and save costs through elimination of splicing.